Damian Lillard finally has an official NBA autograph card, appearing on a pair of signed inserts in 2012-13 Panini Innovation Basketball. Until now, the 2012-13 NBA Rookie of the Year only had autographs in Leaf products. This is because of an exclusive deal Lillard signed last December. While the young Trail Blazers star has several autographs with Leaf, none have been for licensed NBA sets. 2012-13 Panini Innovation Basketball has two Damian Lillard autograph cards. His signature can be found in both the Fine Print Autographs and Rookie Autographs insert sets. Lillard also appears on several unsigned parts of the set as well. These aren't the only Lillard autographs coming from Panini either. They have plans to include him in three more 2012-13 products: 2012-13 Panini Intrigue, 2012-13 Panini Immaculate and 2012-13 Panini Flawless. 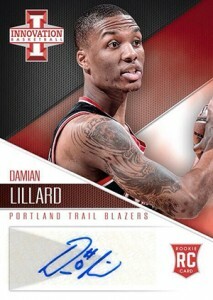 Flawless, which releases in October, hasn't been formally unveiled, features on-card Lillard autographs. Lillard remains under contract with Leaf. Panini was able to include the cards by making an arrangement with Leaf. 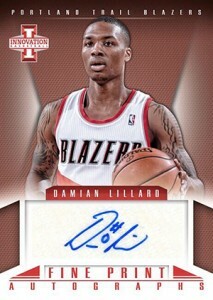 If Lillard signed multi year exclusive auto deal with Leaf, I do not understand how he can sign in Panini. Winston � Likely, Leaf made a deal with Panini to make it happen.